Check it out!! 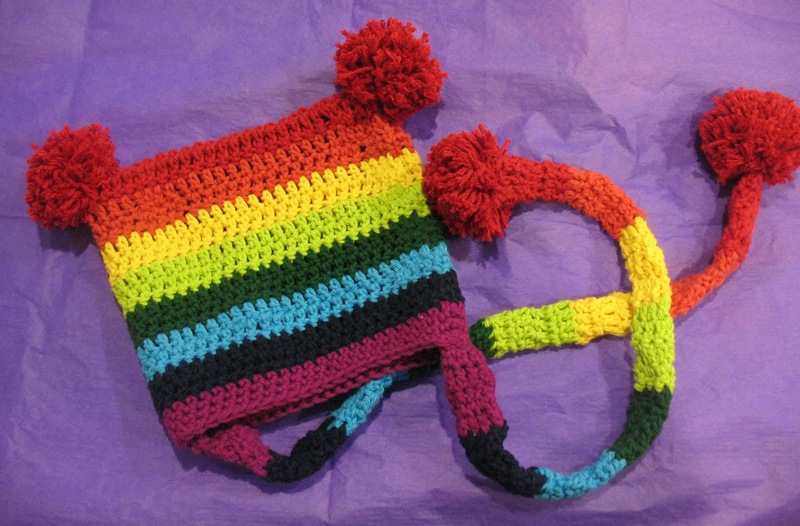 Is this not the craziest, rainbowiest, pom-pomiest hat you have ever seen? I absolutely love it! This was a special request from my friend for her daughter and I'm so glad she asked me to do it because it is spectacular! The best part about it is that it is spectacularly easy!!! No kidding. The only stitches used are dc and sc and there are NO increases or decreases at all. NONE!!! So pull out your rainbow colors and lets get to it! Yarn: Any worsted weight yarn. I used cotton, but I think any similar weight yarn would work. 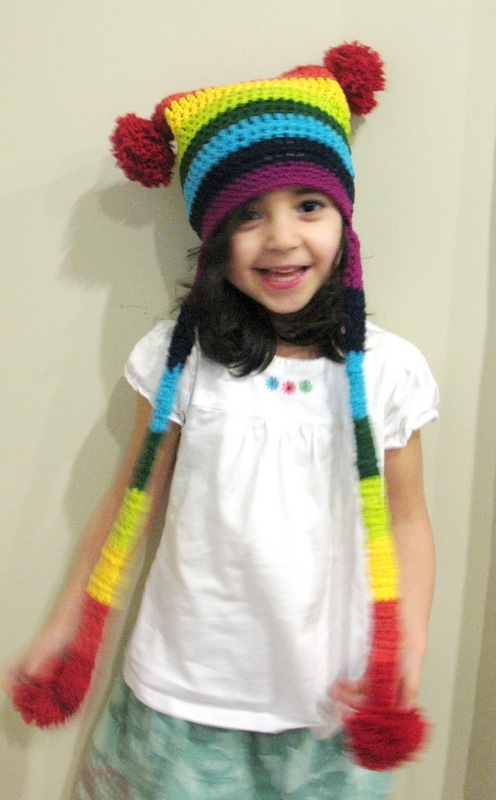 For my hat I used red, orange, yellow, lime green, kelly green, aqua, navy, and plum. Gauge: 11 stitches and 5.5 rows is approximately a 4 inch square. Note: Hat is worked from the top down working two rows of dc for each color, except for purple which is 4 rounds of sc. With red yarn, ch 50, join with sl st without twisting chain. Rd 1: Ch 1 loosely, dc around, join with sl stitch to first dc. (50). Rd 2: Ch 1 loosely, turn, dc around, using orange, join with sl st to first dc of round. (50). Rd 3-14: Repeat rounds 1 and 2 using orange, then yellow, then lime green, then kelly green, then aqua, and then navy for 2 rounds each. Rd 15: Ch 1, with purple, sc in same st and around, join with sl st to first sc of round. (50). Rd 16-18: Ch 1, do not turn, sc around, join with sl st to first sc of round. (50). Fasten and weave in your ends. With hat inside out, sc the top of the hat closed. Fasten and weave in your ends. Note: Your tassels will be worked with 4 rounds of dc for each color. With red yarn, ch 7, join with sl st without twisting ch. Rd 1-4: Ch 1 loosely, turn, dc around, join with sl st to first dc of round. (7). Rd 5-32: Repeat rounds 1-4 using orange, then yellow, then lime green, then kelly green, then aqua, and then navy for 4 rounds each. I used this tutorial by Made to make the pom-poms. There are many ways to do it, but I felt this was the easiest (and the prettiest!). Finishing: Weave in all your ends. Attach tassels to hat at either side. Attach pom poms to corners of the hat and at the bottoms of the tassels. ENJOY!!! Super cute hat and model,too! You're right, Sarah! It's the Pom-Pommiest! pom pomiest is definitely a word!!! I would totally make this hat...but I have the exact one in my daughter closet! I love this hat and am so glad that you loved making it. This is so cool. I love rainbows and I love easy - perfect. Sometimes my projects end up being from others requests. ooh! a bag! What a great idea! yeah :) I made them as a matching set for my 8 year old niece. She's a "big kid" now and wants to start carrying a purse but still likes cutesy things :D so she has a unique set matching hat and purse. Gonna make some of these to donate to Charity! I have made 2 of these so far: one using the same basic colors as this, the other for a team spirit day in UNC colors. It's a definite favorite! It might be my lack of sleep but can you clarify how to move from the the 50 ch st to to the 1 sl st? Since I'm starting at the top of the hat I know I don't want a loop but wasn't sure the correct way to get going with my dcs. THANK YOU!